When it comes down to it, the real question remains: Sportfish or Center Console? 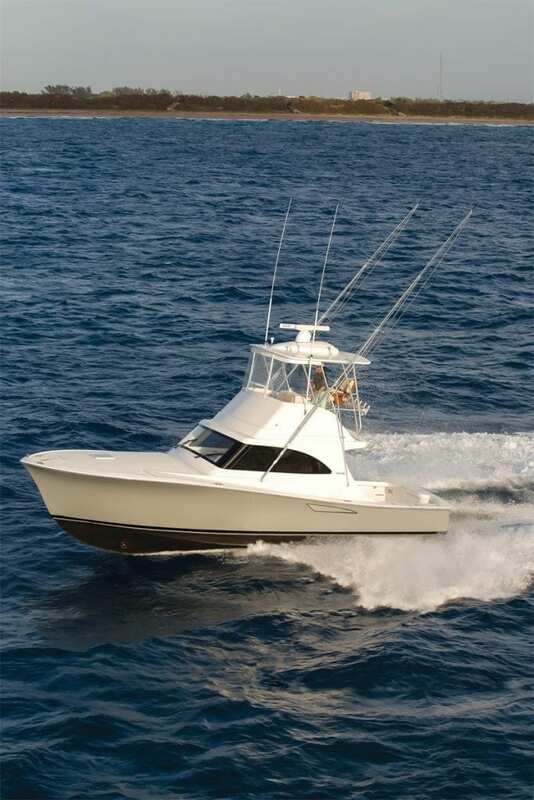 There is certainly no shortage of offshore fishing boats suited for bluewater missions. But a notable change over the last few years is the number of larger, outboard-powered center consoles that now compete on the fishing grounds with similar-sized convertibles, which, in the past, were the benchmark for many boat owners. So which is the king? Sportfish or Center Console? A convertible with a flybridge command station, sizeable cockpit, and mezzanine, spreader supported outriggers, and available tuna tower covers all the bases a serious angler could possibly need. The flybridge offers unobstructed visibility for spotting tailing fish, slicks, rips, bird activity, and protection for navigating in all weather conditions, and there’s ample room for electronics. A centerline helm often has flanking lounges that conceal rod stowage below. Visibility to the cockpit is good for watching baits in the wash, beneath the kites and monitoring angler action below. This sportfish has decidedly more space than a center console. In the cockpit, there’s a bait rigging station, a freezer, tackle stowage, an ice chest, a livewell, below deck fish boxes, and a transom door. If the livewell is built into the transom, it also can serve as another fish box or rigged as a reservoir for live bait tuna tubes. A fishing chair or a rocket launcher adds more to the arsenal, and square footage allows the angler to fight his fish from the transom, while the crew has total access for landing or releasing the catch. After hours, the convertible typically offers a full-featured, air-conditioned salon with entertainment systems. Nearby, a dinette and an adjacent galley—with refrigeration and other appliances powered with an auxiliary generator—makes the boat totally self-sufficient underway and at the dock. Below, a private and self-contained head with a shower complements overnight accommodations in the staterooms. If the weather turns sour and your fishing plans change, the convertible gives you the opportunity to spend the day aboard the boat enjoying these amenities. Similarly, with its accommodations, the convertible serves as a moveable vacation home for the family that wants to both fish and cruise. Years ago, the convertible was the step up for boat owners wanting the next best big thing. But it also meant learning more about maintenance and internal ship systems such as running gear and diesel engines, and understanding how an inboard boat handles differently from one with outboards. Meanwhile, center console builders are not anchored down by their designs. The center console first appeared in the early 1960s as a simple and practical fishing boat. It was a design not unlike a Swiss army knife that could pull off just about any type of inshore fishing assignment. As the style grew in size, more creature comforts such as T-tops and small heads in the console became the norm. 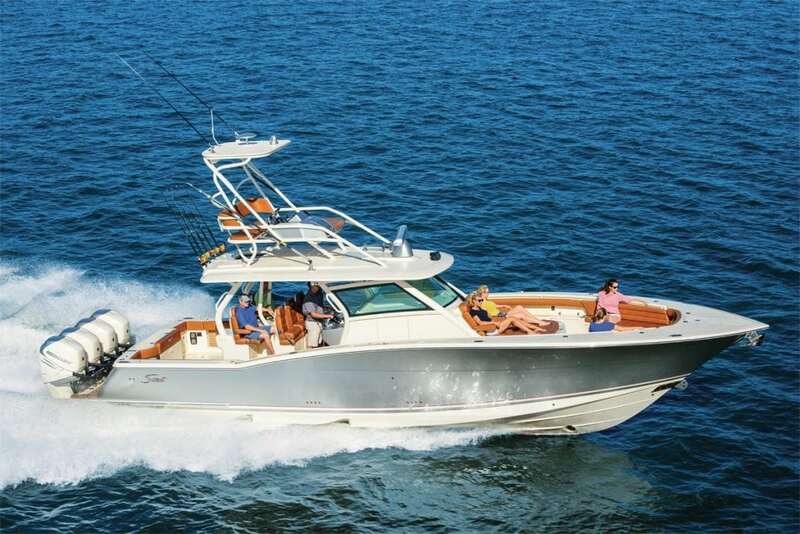 But nothing changed the complexion of the center console as much as the explosive growth of fuel-efficient outboard motors that exceed the 500-horsepower mark. Coupled with two, three, four, or even five outboards with available joystick controls, the operator enjoys fingertip ease maneuverability on center consoles exceeding 50 feet in length. With design cues from convertible boat manufacturers, today’s center consoles are equipped with features for fishing and cruising. The appeal is broad. Everyone from tournament anglers to their families can appreciate a center console. First and foremost, multiple engine packages deliver heady cruising speeds in the 30- and 40-knot range. Some boats can blaze across the water at better than 50 knots. On the days you can utilize all this speed, an operator can be the first one to hit prime territory and stay there longer when the fish are still chewing. The intrinsic beauty of the center console layout is the use of space. Working lines all around the boat and dunking live baits from kites are reasons why crews on big center consoles often win release tournaments. A midship-located helm station provides protection for the operator and generally good visibility. On acceleration, bow rise is mitigated with engine trim until the boat is up on plane. Larger boats also benefit with a tower helm above the hardtop. Windshield design varies from a wraparound plex or acrylic screen to an anodized or powder-coated frame. Get more protection against wind, spray, and rain with a clear vinyl enclosure. Engine instrumentation and multi-function display electronics fit neatly in the dash. Drink holders, stowage bins and aptly placed grab rails are a nice touch. There is more overhead stowage when the boat has a T-top. Most center consoles have two or three seats or a leaning post. But sea conditions and speed over the water will determine whether you are sitting or standing when underway. Handholds are important in any case. Inside the console of larger models, there is room for amenities. That could be a head compartment, a refrigerator, a cooktop, or a convertible dinette for a berth that’s cozy for two. Some smaller-sized center consoles are configured with lower compartments. However, space is better suited for stowing fishing rods and safety gear. Abaft the seats is where the center console boat builder shows its expertise. 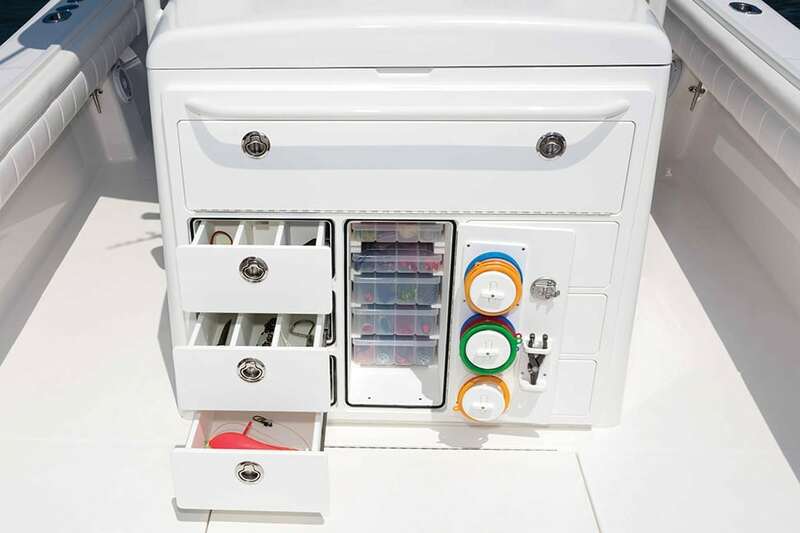 There’s stowage for fishing tackle, a drink cooler, rod holders, and similar gear. This is a good location for a Seakeeper gyro stabilizer, space permitting, so consider other stowage and fish box areas. Some builders offer galley features in the cockpit, such as a freshwater sink, electric grill, and a refrigerator. If so, you will need a generator and a water tank to operate these items underway. The stern is obstructed by outboards. This means fishing off the side. Considering you have the rest of the boat to walk around, it is hardly an issue. When you have multiple hook-ups, it can be an advantage in quick releases and tossing over fresh baits to a lit-up school of sails. Some center consoles have a small door to the swim platform and the engine mechanical. Others have a side door, often preferred when diving and swimming.